Little wonder that "a cherry on top" is thought to sweeten a deal! Whether it's a handful of chopped sweet Bings in a chicken salad, a sour variety baked into a pie or the dried fruit in your muffin or trail mix, cherries add a glisten of crimson and a fabulously fruity taste to an array of sweet and savory treats. The cherry is a stone fruit, or drupe, which means it has an outer fleshy skin around a shell or pit or stone, with a central seed inside. While the English settlers who brought cherries to North America might have otherwise hoped for mild winters, cherry trees require a cold season for dormancy; a mild winter will produce a light crop. The biggest worldwide producer of sweet cherries today is Turkey, followed by the United States and Iran. In the U.S., Washington, California, Oregon, Wisconsin and Michigan are top growers. Russia, Ukraine, Turkey and Poland are the largest producers of sour cherries. In the U.S., sour cherries are grown mostly in Michigan (where Traverse City claims the "Cherry Capital of the World" title), Utah, New York and Washington. Cherries are rich in antioxidants and vitamin C, making them a healthful summertime indulgence. They're also a good source of dietary fiber, vitamin A, folate and iron. Sour cherries are even higher than sweet cherries in vitamin C and antioxidants. Sour cherries are sometimes referred to as pie cherries, tart cherries or red cherries. They're acidic and usually eaten sweetened but are also used occasionally in savory dishes and beverages. Popular varieties include Montmorency (which accounts for 99 percent of all sour cherry production), Morello, Nanking, Amarelle and Early Richmond. Sweet cherries range from mildly sweet and delicately flavored to extra sweet and rich. Varieties include Bing (the most popular, named in 1875 for Chinese orchard foreman Ah Bing), Lapin, Tulare, Chelan, Rainier, Lambert and Sweetheart. You may also have heard of chokeberries. Another type of cherry, these are too sour for eating raw and are used mostly in preserves. Dried cherries are made from both sweet and sour cherries. They're usually freeze-dried or air-dried. A true cherry lover knows there's no better way to savor this seasonal fruit than lingering over a bowl of sweet cherries, enjoying them one-at-a-time, in a nice, sunny spot. But they're also a stellar addition to oatmeal, yogurt, pancakes, grains and salads. In fact, it's easy to incorporate cherries at any meal or snack and in virtually any dish. Cherries partner well with most other fruits. Use fresh cherries to add a pretty touch to a berry and plum fruit salad, for example. Or pair them with spinach, couscous and almonds for a barbecue-friendly side salad. Cherries make luscious preserves, jams and chutney—delicious when served like so: Grilled Chicken with Cherry Chutney. Want cherries to take center stage? Feature them in a Black Forest Cake, or use them to make a big batch of Cherries Jubilee, a classic cherry sauce to serve over ice cream or cake. Layer fresh cherries and cherry preserves with cake, cream and mascarpone cheese in a Cherry Trifle. And if you've stocked the freezer with cherries, try this Dark Cherry Smoothie for a quick, nutritious snack. Dried cherries add chewy texture, rich color and a sweet bite to all kinds of desserts, like Cranberry Oatmeal Cookies and Maple and Dried Fruit Stuffed Baked Apples. Consider substituting them for raisins in most any recipe, like this sweet Arborio Rice Pudding with Raisins. Dried cherries are terrific in savory dishes, too—try them in place of dried cranberries in stuffings and rice pilafs, for example. Cherries are especially delicious when served with mascarpone or cream cheese, crème fraîche, ricotta, brie, chevre or fresh mozzarella. Almonds, walnuts and pecans are excellent complements, too. 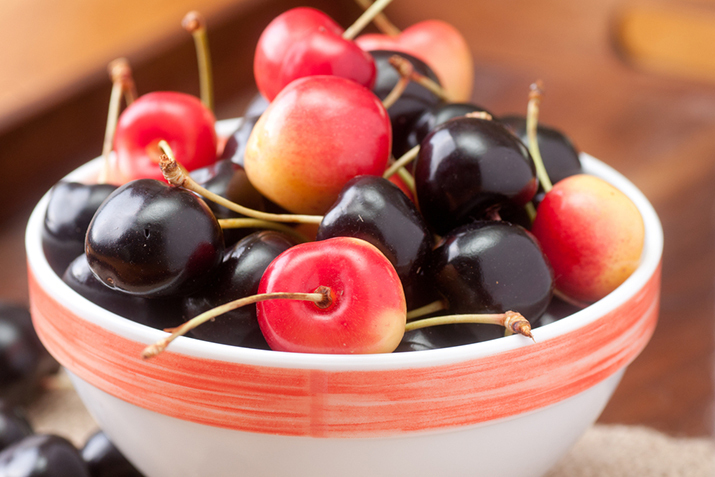 Available in summer, sour cherries begin their season in June and sweet cherries in July. Buy cherries that are large, glossy and firm, with even coloring. Avoid soft, mushy or wrinkled cherries. Store them in plastic or produce bags or storage containers in the refrigerator for up to a week and wash just before preparing. For best flavor, bring them to room temperature before serving fresh. You can also freeze cherries: Rinse and drain well, then spread in a single layer on a cookie sheet and freeze. Transfer the frozen cherries to freezer bags and store in the freezer for up to a year.